A Midsummer Night’s Dream by Free Shakespeare! Free Shakespeare! is a traveling community of artists. Our goal is to create an event where people can rediscover the power and beauty of language and art. This very casual evening will include an art exhibition accompanied by live music followed by a free performance of one of Shakespeare’s plays. The traveling theatre troupe is no longer a thing of the past. Free Shakespeare! is bringing a summertime dose of art, music, and theatre to the Miami Valley. Community artists will come together this summer in four area parks to share their work. Our community needs this event. The current economy has taken its toll on every level of society. When money dries up, the first programs to be effected are athletic and artistic endeavors. To keep pace, these programs must institute “pay to play” policies, putting further strain on the families who need these options the most. Free Shakespeare! will make these cultural opportunities more accessible. By bringing art directly to communities, free of charge, we make it simpler for people to experience it. Simply show up. That is all we ask. 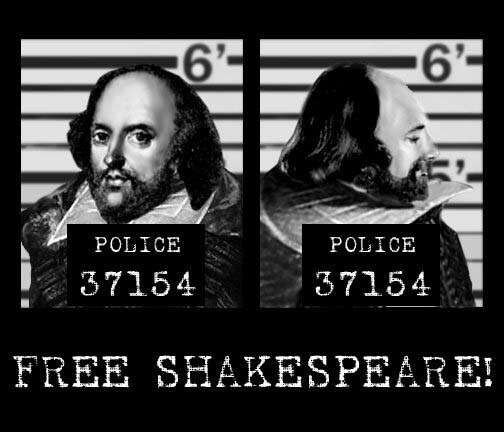 Free Shakespeare! is dedicated to liberating the works of William Shakespeare and exposing his cause to the world. Shakespeare’s plays deal with universal themes relevant to humanity and the world we live in. From joy, love, and redemption to greed, lust, and corruption, his work runs the gamut of human experience. Unfortunately, his work is widely regarded as archaic, irrelevant, and inaccessible. We will present his plays in a fashion that is interactive and easy to follow. For ninety minutes, the audience will be a vital participant in the story as it unfolds. They will leave the park with a new perspective on art and its capacity for change. As a society, our language skills are on the decline. The prevalence of texting, instant messaging, and “tweeting” have forced us to communicate in smaller and smaller doses. Words are shortened to letters; vowels are regarded as unnecessary; the only thing that matters is if the message can be contained to 140 characters or less. This has a debilitating effect on our linguistic capabilities. But all is not lost. As a community, we can wage war on the linguistic apathy running rampant throughout our nation. Presenting the works of William Shakespeare is one step we can take. By simply exposing people to his work we are taking dramatic action to begin correcting this problem. References to Shakespeare and his work abound throughout popular culture. He coined over 3,000 words and phrases, many of which are commonplace today. People deserve to know where their language comes from. We must cultivate an appreciation and respect for language before it dies out. Language gives us voice; without it, we have none. SPECIAL ANNOUNCEMENT!!!! Tonite at 7pm at the Antioch College Amphitheater, Free Shakespeare! 's final dress rehearsal will be open to the public as a preview performance. Please come out and watch the show, and then tell everyone you know about it. A Midsummer Night's Dream runs approx. 90 minutes.